One day when I had my first meeting with holiness people. 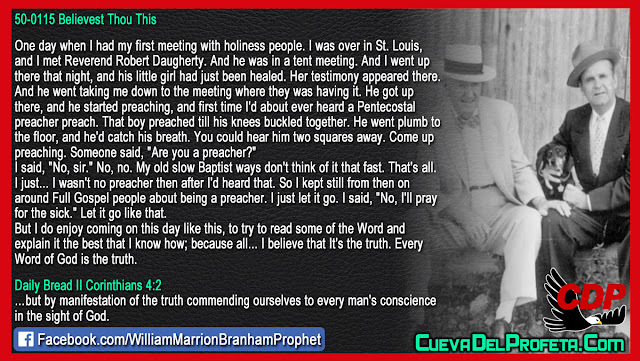 I was over in St. Louis, and I met Reverend Robert Daugherty. And he was in a tent meeting. And I went up there that night, and his little girl had just been healed. Her testimony appeared there. And he went taking me down to the meeting where they was having it. He got up there, and he started preaching, and first time I'd about ever heard a Pentecostal preacher preach. That boy preached till his knees buckled together. He went plumb to the floor, and he'd catch his breath. You could hear him two squares away. Come up preaching. Someone said, "Are you a preacher?" I said, "No, sir." No, no. My old slow Baptist ways don't think of it that fast. That's all. I just... I wasn't no preacher then after I'd heard that. So I kept still from then on around Full Gospel people about being a preacher. I just let it go. I said, "No, I'll pray for the sick." Let it go like that. But I do enjoy coming on this day like this, to try to read some of the Word and explain it the best that I know how; because all... I believe that It's the truth. Every Word of God is the truth. …but by manifestation of the truth commending ourselves to every man's conscience in the sight of God.